Directions: Peel and chop apple into thin, small slices and set aside. With a whisk, beat together eggs, almond milk, and banana. 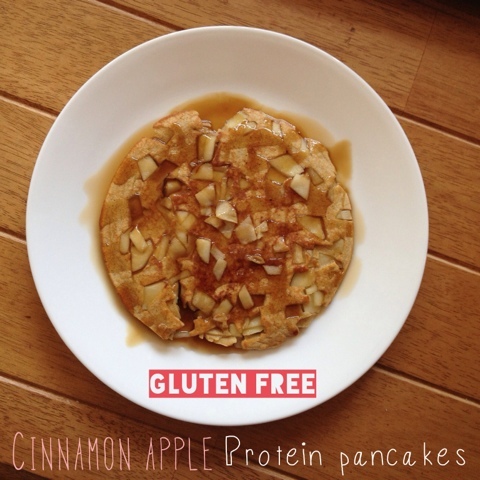 Stir in cinnamon, gluten free flour, protein powder, and stevia until combined. Heat a pan over medium-low heat and saute 1/2 of the apple until soft. Pour 1/2 of pancake batter over apples and cook until the top side starts to bubble. Flip pancake and cook until the other side is fully cooked. Repeat with other 1/2 apple and other 1/2 of pancake batter. Makes 2 servings. Top with more sliced apples or banana and agave nectar.